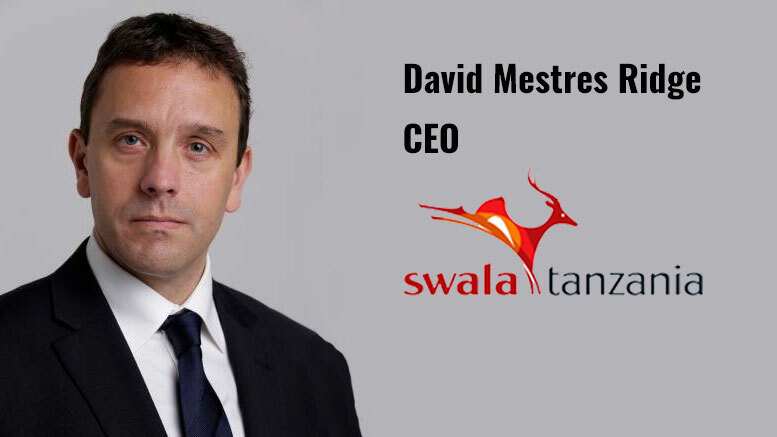 TanzaniaInvest interviewed David Mestres Ridge, CEO of Swala Oil and Gas (Tanzania) plc (DSE: SAWLA), a Tanzanian oil and gas exploration company that is actively exploring the East African Rift System. David discusses the prospect for oil discoveries in Tanzania, provides an update of the exploration activities of Swala in Tanzania and abroad, and clarifies about the ongoing corporate bond offering to investors. TanzaniaInvest: Swala Tanzania was established in 2011 to undergo exploration of hydrocarbon in Tanzania. Particularly, the company is focused on the Rift System oil potential. Why Tanzania, and why oil, when no oil has been discovered to date in this country, but proven gas reserves abound? David Mestres Ridge: Whilst there may be proven gas reserves, most if not all are deep offshore in environments suited to bigger companies. Swala started by focusing on the Rift System, an environment in which oil has already been discovered (Uganda, Kenya…). We know that there are indications of oil systems in Tanzania – seeps, slicks, tar balls, the Tundaua oil seep on Pemba Island – and are confident that commercial oil can be discovered in Tanzania. TI: Swala currently has equity in a number of exploration licences in Tanzania, and has an active business development program in Tanzania and elsewhere. Can you provide an up-to-date description of your licenses, Swala’s interests and the actual status of explorations? What is your drilling program for 2017? DMR: We started off with two exploration licences in Tanzania – Pangani and Kilosa-Kilombero. We were awarded both in 2012 and, in the subsequent years, we invested heavily in surveys and seismic acquisition to determine the potential of each of the licences. Unfortunately, Pangani has no commercial potential and we asked to be allowed to surrender it. On the other hand, Kilosa-Kilombero showed significant potential, with a large-scale prospect (which we called Kito) and a number of additional prospects around it. In 2017 we shall be drilling the Kito prospect and we are already preparing the team that started work on the project in 2016. In 2016 we also took our first step overseas as a way to start to grow the company. Block D in Burundi is a technically very interesting block in an area where oil slicks and tar balls have been identified. We are carrying out technical work on the available data on the block and look forward to investing further once the political situation in Burundi stabilizes. TI: Swala listed at DSE in August 2014. Why did you choose to list at DSE, when other companies active in minerals in Tanzania are listed at LSE? What are the prospects for dividends in the near future? Our view when we set up the company was that we wanted to open the investment opportunity to Tanzanians and we wanted to contribute to the development of the Tanzanian capital markets. There is plenty of evidence showing that liberalized and active capital markets are important contributors to economic growth. That said, Tanzania must also recognize that there are significant barriers to that development, ranging from -at one extreme- a fiscal and regulatory regime that hinders economic activity through to -at the other extreme- the lack of market infrastructure (liquidity, research, etc…) that we find in the places I mentioned earlier. It will come, but we need to help make it happen. TI: In October 2016 Swala engaged Exotix to place corporate bonds of up to a value of USD120 million in order to finance a material transaction. What has been the success of the placement? What are you future financing need and what are the investment opportunities available? DMR: Buyer and seller want to ensure that Swala opens up investment opportunities to Tanzanian institutions and individuals within this Exotix transaction. What we did was to split the USD120 million into two tranches – a USD60 million tranche that is primarily placed within London and a second tranche, also of USD60 million, that we aim to make available in Tanzania. We have started to talk to some of the banks and the pension funds, and have received quite a lot of interest in what are essentially USD-linked, but shilling-denominated, corporate bonds. The main problem is the requirement that institutions may only invest in bonds with coupons greater than that provided by Government bonds with the same tenure. No-one is going to place corporate bonds that pay an interest of 20% when they can raise money elsewhere at much lower rates. Look at our raise, as an example: if we raise USD60 million at -say- 10% for five years we are paying a total of USD30 million on the debt. At 20%, this would be USD60 million. Why would we pay another USD30 million for the same instrument? By keeping rates uncommercially high, the danger is that – in this example – USD30 million that could go into the Tanzanian economy go elsewhere. This is one of those things I mentioned earlier that will require a review of policy if we are to encourage the development of the local economy.